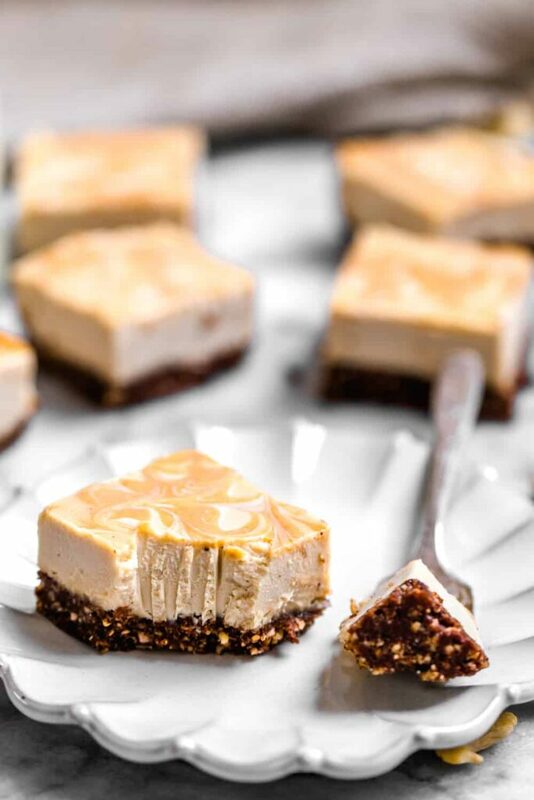 Are you ready to get down on an easy-to-make, no bake peanut butter cheesecake? 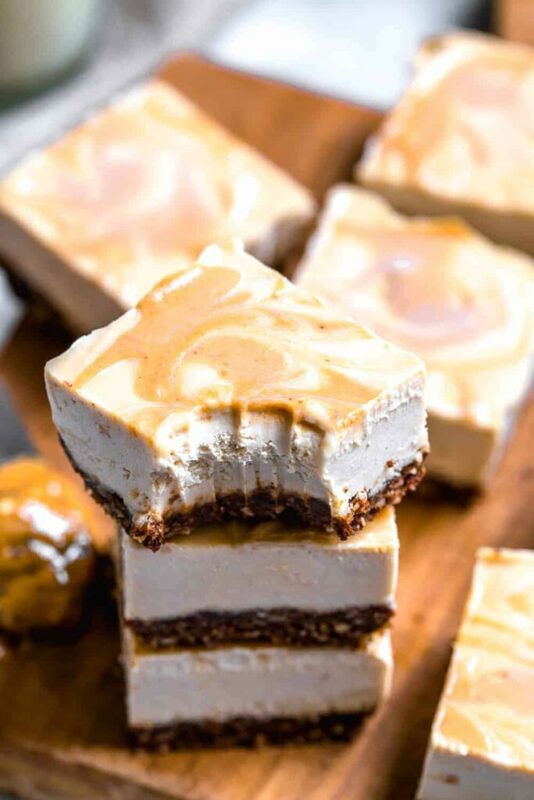 These peanut butter cheesecake bars are gluten free, vegan, refined sugar free, and can be made paleo if you swap out the peanut butter for cashew or almond butter. Score! 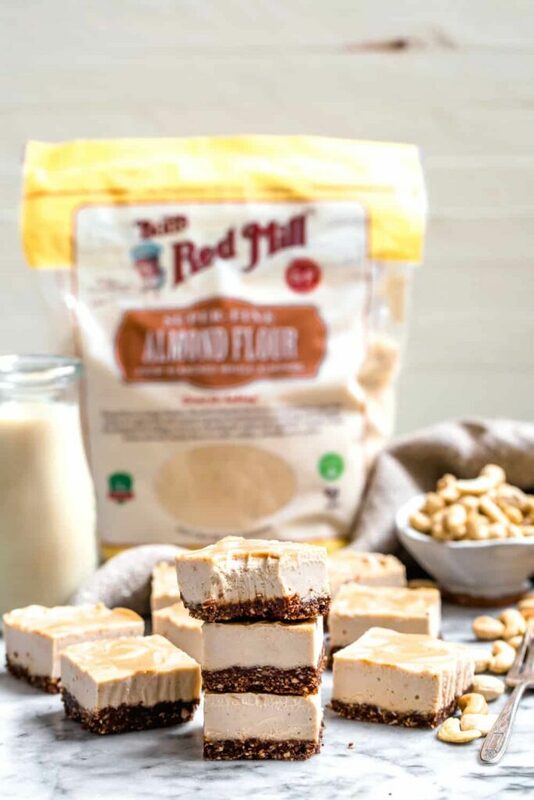 Just wanted to let you know this cheesecake bars recipe is sponsored by Bob’s Red Mill. It’s turning out to be a HELLUVA week over here. With only 11 days left until my official “due date”, I’m keeping my plate and to-do list stacked pretty high. Today is also our 3-year wedding anniversary. Since Tim had to work today, we are going to officially be celebrating tomorrow in Los Angeles. We are heading out to an evening with WOLVESMOUTH, and I am beyond excited. How awesome does this sound? We are beyond thrilled they were able to accomodate us so last minute. Let’s hope babygirl stays put and doesn’t decide to make an early debut, eh? Yesterday was a fascinating play by play of events. I had to drive out about 45 minutes for an appointment I had, and boy is it hard to hold my bladder for that long nowadays. After my appointment, I had dinner plans with my lovely friend Rachel over at Bakerita. We were going to meet up for dinner at Nectarine Grove but I started feeling some contractions during therapy and got nervous. I hadn’t experienced many Braxton Hicks contractions throughout my pregnancy, so it was a bit difficult for me to figure out whether or not these were the real deal or not. I decided to cancel my dinner with Rachel *just in case* and drove home. 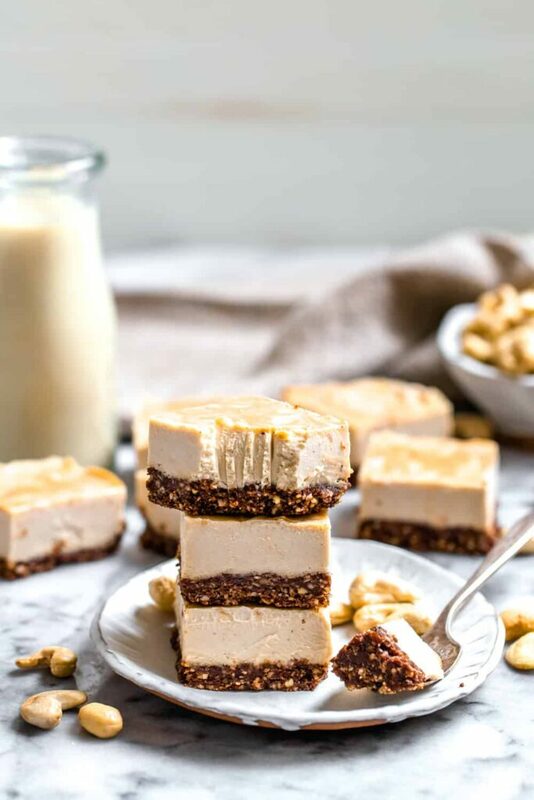 I had planned on bringing her some of these fabulous no bake peanut butter cheesecake bars. We were actually going to do an exchange. She was supposed to bring me some sweet and salty brownies, and I was VERY much looking forward to it. Now we’ll have to postpone our dinner date until after baby S is born. The cheesecake bars are hanging out in my parents’ freezer, and my mom already snuck a few down the hatchet. She says they are perfectly light and tasty. Woo. I think the almond flour within the crust is a bit of a game changer. It brings a texture that cannot be replaced or replicated by another nut flour. You’re going to be licking your fingers up, I promise. I think this may be one of the last recipes I am going to be able to share with you before I begin maternity leave. Luckily, I have a large handful of cheesecake and cheesecake bars recipes for you to peruse through while I am gone. MAJOR UPDATE: Baby Sophie was born! I ended up going into labor just a few hours after I started writing this blog post. I bet having no bake peanut butter cheesecake bars at the hospital would have been nice. I opted in for lots of dried mango instead. That’s pretty much all I wanted while I was laboring. I’m not going to get into my birth story now because I’m going to be creating a separate post for all of that goodness. I will however say that it’s been absolute bliss having her here with us. In fact, she’s taking a nap in her Rock ‘n Play right in front of me now. She had a frenectomy procedure done yesterday (removing her tight frenulum, as she had a third degree tongue tie) and has been resting a ton since then. This will ensure we are going to have a more seamless experience in getting her to latch on to my breast without pain. Whew. *UPDATE* I am now on maternity leave, officially! However, Tim is going to be at home with me until mid August. I should be able to get a bit of work done here and there. Otherwise, I think I’d go a bit stir crazy. Hey, to each their own. I have to do what I feel works best for me. I’m cool with working a few hours here and there. 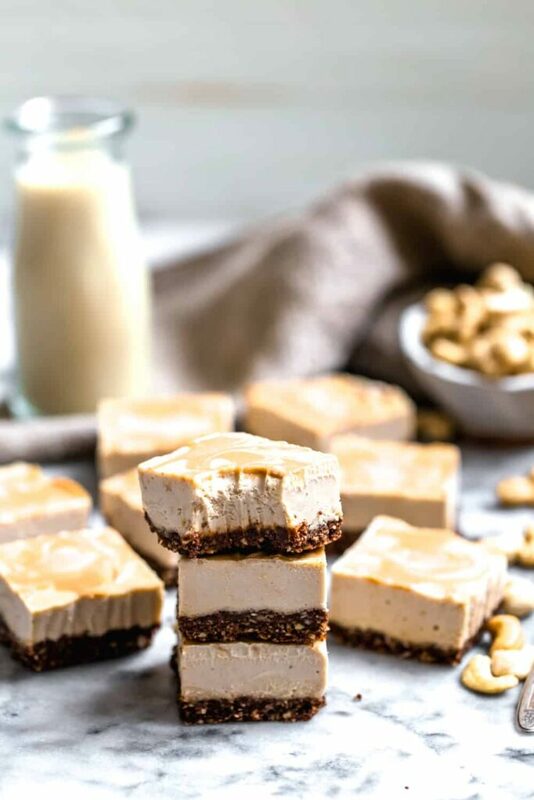 It makes me happy… and eating no bake peanut butter cheesecake bars is a sure way for any new mama to feel completely blissed out. Am I right?? 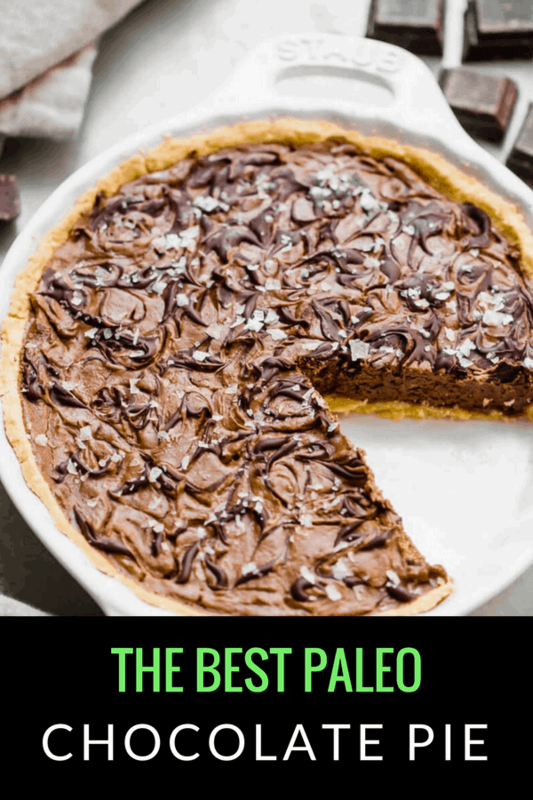 Use cashew or almond butter instead of peanut to make this recipe 100% paleo! 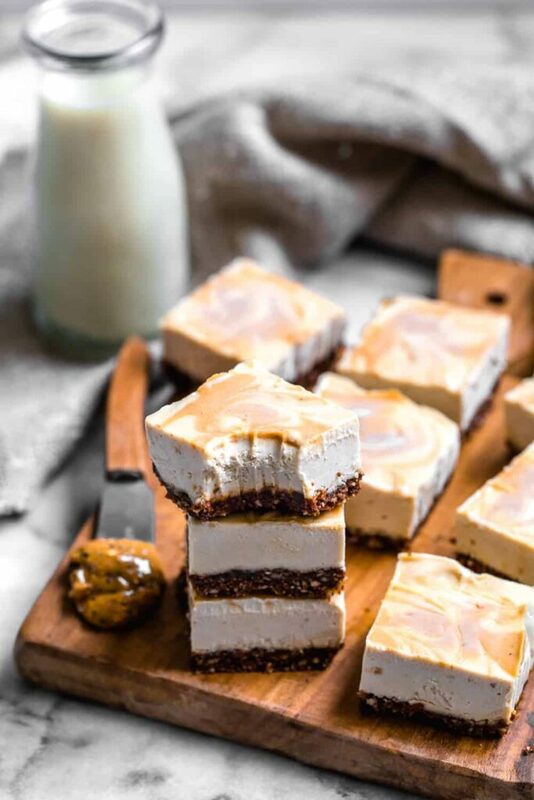 You can add a big drizzle of nut butter across the top of the cheesecake bars batter and swirl it around using a toothpick or butter knife for extra nut butter goodness! Add cashews to a bowl and cover with boiling hot water. Let set, uncovered, for 1 1/2 hours. Rinse with cold water and drain thoroughly. Set aside. Line an 8x8" baking dish with parchment paper and set aside. Combine the nuts in a food processor and pulse until you get a coarse mixture. Add the rest of the crust ingredients and pulse several times until it starts clumping up and forming together. Be sure to add another date or 2 if the mixture doesn't stick together easily on the side of the food processor. Transfer the crust mixture into the pan. Press down with your fingers to pack it evenly into the bottom of the pan to create an even base. If it starts to get too sticky to work with, lightly wet your fingers with warm water. Set aside. Pour the filling over the crust. Tap on the counter a couple of times to release any air bubbles that may have formed. Set aside. Place in the freezer to set for at least 4 hours or overnight. Leftovers can be stored in the freezer for up to 2 weeks. Enjoy!